Hilltop Hoods are set to drop their brand new album ‘Walking Under Stars’ through their own label Golden Era Records/UMA on Friday August 8th, 2014. The album will also be released via Universal in Canada, Austria, Germany, Switzerland, UK, New Zealand, Benelux as well as USA via Fontana. The album is the highly anticipated follow up to 2012’s double platinum album ‘Drinking from the Sun’. The band has managed to once again push the envelope for Australian hip hop with the incendiary ‘Walking Under Stars’, a release that promises to be unlike anything fans have heard before. New Zealand soul songstress Aaradhna guests for ‘Walking Under Stars’ alongside UK’s rising soul star Maverick Sabre, the legendary Brother Ali, ARIA Award winning soul rocker Dan Sultan and fellow Best Urban ARIA winner Drapht. While radio has already fallen in love with the first single ‘Won’t Let You Down’ (Feat. Maverick Sabre), Hip Hop heads will relish in the festival anthems in waiting. The undeniable nostalgic swagger of ‘Cosby Sweater’ and the melancholy harmonies of ‘I’m a Ghost’ both bring a unique sound synonymous with the Adelaide trio on one of the year’s most anticipated releases. 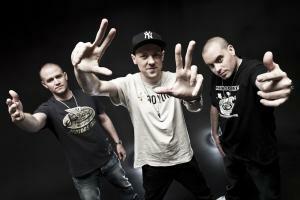 With both local and international tours scheduled to support the release of their brand new album ‘Walking Under Stars’, 2014 will undoubtedly be another year full of milestones for Australia’s greatest hip hop act, Hilltop Hoods.